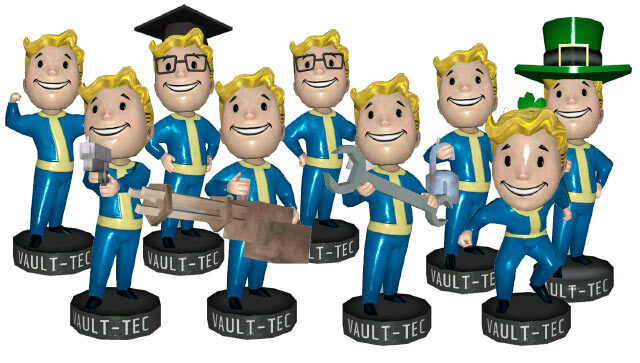 There are 20 different Bobblehead types available in Fallout 76. There are over 350 random locations of Bobbleheads in Fallout 76. There is no rule in which locations the Bobbleheads are present in your version of the game world. Vault Boy Bobbleheads in Fallout 76 work differently than in previous parts of Fallout. The Bobblehead bonus is temporary. The basic Bobbleheads activity time is 1 hour, but you can extend this time using other skills, up to a maximum of 4 hours. Bobblehead does not appear in the game world always in the same place. There is a set of places where you can pick up Bobblehead but you do not know which one will appear at the moment. You can hide Bobblehead into the inventory and use it later. You can collect Bobblehead for the collection by putting it on a special shelf. Using a collected Vault Boy bobblehead will grant a significant, long-term (though temporary) bonus, like an increase to a SPECIAL attribute. The Percepti-Bobble Perk will give you a directional audio cue when a Bobblehead is nearby. Agility Bobblehead	- gives: +2 Agility. Big Guns Bobblehead	- gives: Heavy gun damage increased by 20%. Caps Bobblehead	- gives: Cap stashes likely to hold twice as many caps. Charisma Bobblehead - gives: +2 Charisma. Endurance Bobblehead	- gives: +2 Endurance. Energy Weapons Bobblehead- gives: Energy gun damage increased by 20%. Explosive Bobblehead	- gives: Explosive damage increased by 20%. Intelligence Bobblehead - gives:	+2 Intelligence. Leader Bobblehead	- gives: Earn 5% more experience. Lock Picking Bobblehead	- gives: Sweet spot is 30% bigger. Luck Bobblehead	- gives: +2 Luck. Medicine Bobblehead	- gives: Stimpaks heal 30% more. Melee Bobblehead	- gives: Melee weapons deal 20% more damage. Perception Bobblehead	- gives: +2 Perception. Repair Bobblehead	- gives: Fusion cores last 30% longer. Science Bobblehead	- gives: An extra guess when hacking. Small Guns Bobblehead	- gives: Ballistic gun damage icnreased by 20%. Sneak Bobblehead	- gives: Sneaking makes you 30% harder to detect. Strength Bobblehead	- gives: +2 Strength. Unarmed Bobblehead	- gives: Unarmed attacks deal 25% more damage.